Much like other organizations throughout our five-county service area, United Way of East Central Iowa (UWECI) hosts an internal workplace campaign every year. With a prominent goal of $30,500, the Internal Campaign Committee planned a variety of fun activities to get our team of 27 excited and involved! Campaign kickoff breakfast: Complete with chocolate chip pancakes and a yogurt bar! 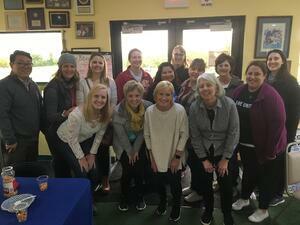 Mini golf outing: The winner of the outing won a year’s worth of bragging rights. In addition to the outing, staff bid on the chance to play with a UWECI mini golf legend, who is also one of the founders of the annual event. Time, talent, and treasure silent auction: Employees bid on items during a week-long silent auction. Auction items included gift baskets, cake pop parties, VIP parking spots, a hand-crafted end table, holiday wrapping, and more. Panera event: Twenty-percent of orders at Panera on the evening of October 17 went to United Way—we may or may not have ordered bread bowls for dinner and cinnamon crunch bagels for the next morning. Bake, book, and movie sale: Complete with a sweet and salty spread of treats, a variety of books (we’re talking cook books, mystery novels, children’s books, and more), and a handful of movies both new and old! Human Services Campus building lunch: For $5 each, employees and visitors at the Human Services Campus building could purchase lunch consisting of walking tacos, dessert, and beverages. Pumpkin decorating contest: For $5, staff could pick a pumpkin to take home and carve or decorate. The winner was selected by an anonymous and unbiased group of judges and announced on Halloween! Although we have neared the end of campaign, there’s still one more event that will take place this week; chair massages! Final calculations will be made following the last event, but we are happy to say we have surpassed our goal and are sitting right around $31,100! A big thank you to our Internal Campaign Committee for planning and organizing all these activities for us.